Divorces are complicated, and it’s easy to focus on making sure you get a piece of big assets, like the house, your investment accounts, and the vehicles. Don’t overlook the retirement accounts! Retirement accounts can represent a huge asset, but many spouses don’t think about them, especially if retirement is 10 or 20 years away. That could be an incredibly expensive mistake, especially because it will be extremely difficult to go back and fight for a piece of your spouse’s retirement account after the divorce is complete. How Much of My Spouse’s Retirement Can I Get? States divide martial assets differently, but regardless of which state you live in, you are entitled to at least a portion of everything your spouse earned while you were married. (Heads up! 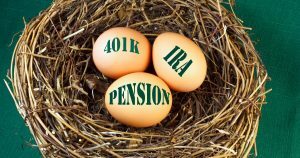 If you are the one who has contributed to the retirement account, then they have a right to get part of yours.) This includes all the money that put into a retirement account. If you live in a community property state, such as California, you are entitled to half the value of all the money he put into the account and its earnings during your marriage. Depending on the length of your marriage and how much your spouse stashed away, that could represent tens of thousands of dollars or more. This money could be a lifesaver as you begin your post-divorce life. You won’t just be able to ask your spouse to hand over half of their retirement account to you. In order to get your fair share, you’ll have to submit a special document to the court. The type of document you submit will depend on the type of retirement or pension account your spouse has. If they have a retirement plan sponsored by a private employer, you’ll submit a Qualified Domestic Relations Order (QDRO). You’ll have to fill out a different order if your spouse works for the military or is a government employee. In a nutshell, the QDRO will instruct your spouse’s retirement plan administrator to provide you with a certain amount or percentage of the funds from your spouse’s retirement account. The administrator will then review the order to ensure that it meets their standards. Since there are hundreds of thousands of different retirement plans out there, you’ll definitely want the help of a savvy QDRO professional to help you fill out the order correctly. You are in luck! You actually get to decide how you want to receive the payout from your spouse’s retirement account. If you need money to buy a home or car after the divorce, you may consider taking some, or even the entire amount, as a lump sum. The good news is that you won’t face the 10% early withdrawal if you use the QDRO. The bad news is that they will withhold at least 20% in withholding taxes for the federal government and possibly more for state taxes, and you may owe even more at tax time. Since your spouse didn’t pay taxes on the money when it went into the account, you’ll have to pay them now. You might want to consider rolling the money into an IRA so that you can save for your own retirement. You probably have a lot of bills to pay as part of your divorce and your rebuilding period, but make sure you take care of your future, too! Worried that you might be missing out on more big assets during your divorce? Then talk to experts before you start down the divorce path.